Don't Overlook That Dip in Your Roof, Roof Lines Should Be Arrow Straight! 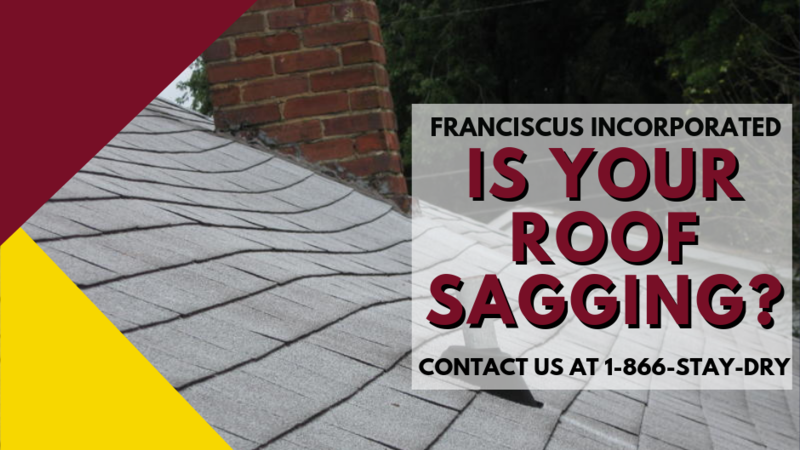 Don't Freight - Franciscus Incorporated Can Help with ALL Your Roofing Needs! Roof lines should be arrow straight. If you can see a dip, curve or swag on the peak when standing in the street, your roof has a problem. It might be something basic you can handle yourself, but it's likely to be more complicated and require intervention by a professional. Climb into the attic and familiarize yourself with your roof's structural anatomy. Framing terminology for a roof line can be reduced to a simple triangle. When crouched or standing in the attic, the horizontal boards below your feet are the ceiling or roof joists. The sloped boards above your head are the rafters. The rafters attach to another beam -- the ridge line -- at the top. The shape of the three boards form the familiar triangle of the roof. This shape is capable of supporting a large amount of weight. It's typically enough to support the accumulated weight of the roof, including roof sheathing and shingles, and other external forces such as snow and ice. The rafters transfer the weight to the joists, and the joists transfer the weight to the exterior walls. When everything works together properly, the roof line should be straight. Sagging roof lines can originate with the horizontal ceiling rafters: When the roof framing is assembled, two ceiling rafters are often joined together to create a longer span. They are typically lapped and toe-nailed together in the center to achieve the needed length. As the accumulated weight of the roof and/or heavy snow exerts pressure on the roof, it pushes the rafters outward; in turn, the rafters push on the exterior walls on both sides. If the joints are not lapped, and instead butted together, they can pull apart. If the weight and pressure is sufficient, even properly lapped joints can loosen. When the joints pull apart, it causes the ridge line to drop or sag as the exterior walls tilt slightly outward. Even if the sagging is not noticeable from the exterior, there may still be signs of sagging inside your home. Look for cracks in the drywall on the ceiling. Another type of roof framing includes the use of a central beam. The system is similar to lapped ceiling joists, but instead of lapping two joists together, two individual beams join onto a larger beam running perpendicular to the joists. The joists are attached on both sides of the beam via metal hangers. As the accumulated weight of the roof creates pressure, the hangers pull loose from the beam and the exterior walls to move outward, resulting in the sagging roof line at the top. Depending on the design of the framing, another component is sometimes added to the triangle shape of two sloping rafters. The rafter tie or collar is a horizontal piece that connects the two rafters on either side. It's typically nailed to both rafters about halfway up. The rafter tie is designed to prevent rafters from moving away from each other. If the placement of the rafter ties is not correct -- the idea is to form a perfect triangle at the top with the tie -- it can be compromised, and becomes insufficient to stop rafters from spreading. Other problems occur when rafter ties are insufficiently nailed to the rafters. The nails pull loose and the rafters spread apart. Some roof framing designs include the use of a strut or beam that runs perpendicular across the bottom of the rafters inside the attic. The beam is attached to both exterior walls, and to the bottom of each sloping rafter to give the roof strength. If the beam is not properly nailed, it can also pull loose, and this contributes to roof sagging. Problems may also occur if the beam or strut is the wrong size, or defective with cracks or splits. In some cases, roof sagging problems are not caused by framing issues. Rotten or saturated sheathing can also cause roof lines to sag. This is the easiest problem to repair. If the framing is sound, and problems are not found elsewhere but the roof still sags, the problem might have originated because of poor installation of the plywood sheathing or shingles. When water penetrates through the shingles it causes the plywood to warp, weaken or rot, causing the roof to appear as if it's sagging between rafters. Problems with and repairs to a sagging roof should be evaluated by professionals. It might be a simple fix that can be done by jacking up loose rafters, adding struts or, more economically, by simply by replacing sheathing and shingles. The extent of repair can be somewhat difficult to determine, but if you see obvious broken rafters, joists or beams, consult with a professional to ensure that your roof is repaired properly. Luckily for you, our qualified team members here at Franciscus Incorporated would be more than happy to assist you with ALL of your roofing needs. Give us a call today to get started, 1-866-STAY-DRY!